Facebook video is taking over. Last year, for the first time, it surpassed the number of YouTube videos that were uploaded to pages on the site. According to a SocialBakers study of more than 180,000 Facebook videos on 20,000 pages in December 2014, people posted 20,000 more Facebook videos than YouTube videos . Another study by SocialBakers revealed that even when Facebook videos were not as popular as YouTube videos, they received a 40 percent higher engagement rate on the site. 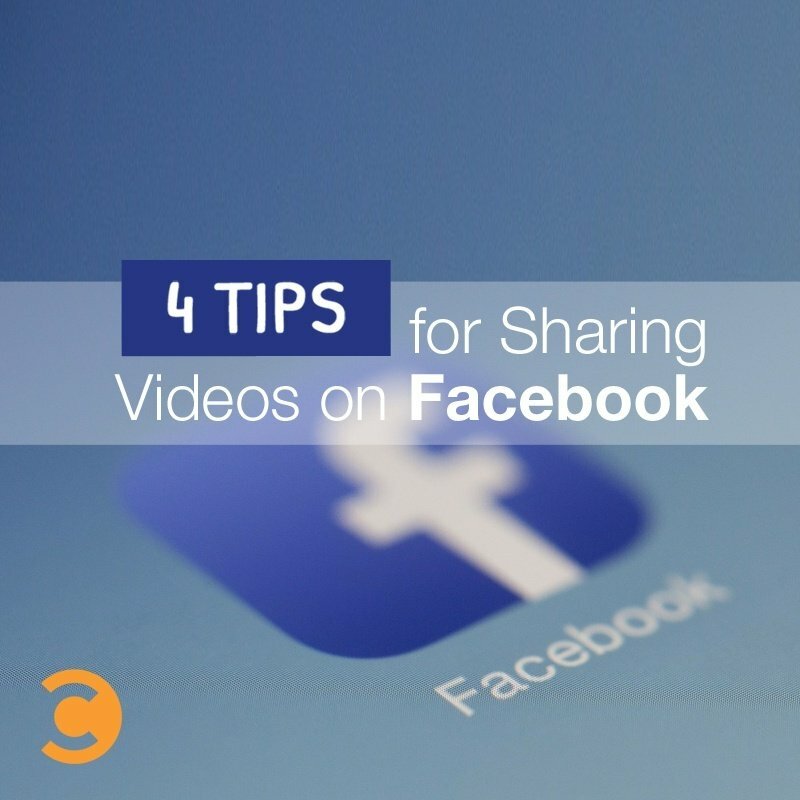 While it’s important for brands to make use of various types of marketing channels, uploading videos directly to Facebook can greatly benefit your page. The following are some tips on how to do it so that your campaigns are as effective as possible. Facebook videos should be seen as tools to increase your number of page likes and the amount of likes on your content. They should also get conversation going on your page amongst your fans and followers. To implement this tip, you can include a call to action on your video to hit the “like” button on your page. This kind of video should be the one that’s featured prominently in the “about” section. If it’s hidden away in your video library, less people are likely to see it. To further develop your page, you can also encourage people to like the video, share it, or leave a comment. You might want to ask a question to your fans in the video, or include one in the description. 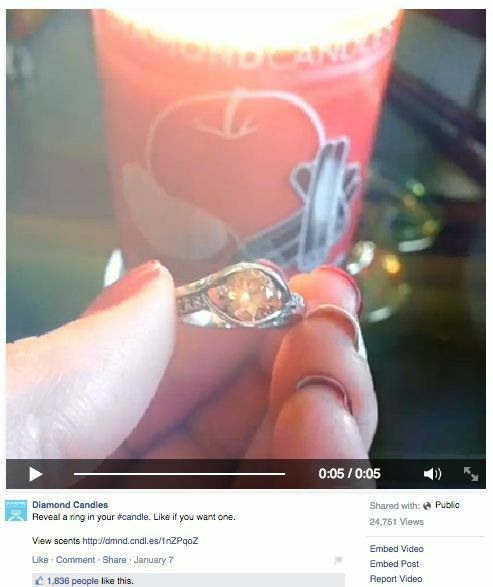 Diamond Candles, which gives lucky customers rings worth thousands of dollars with their candle purchases, posted a video showing off their merchandise. They told fans to “like if you want one” and received 1,836 likes and nearly 25,000 views. Since Facebook videos can only be shared on the site, you won’t be able to repost your call to action videos anywhere else. If you want to get more of your YouTube subscribers or Twitter followers to like your Facebook page, you’re going to have to upload a video from YouTube or another site onto your other accounts. When a news item or fad is in style, people’s newsfeeds are bursting with content about it. Just take the marriage equality Facebook photo or the KONY 2012 video, for example. You want to be there, on your audience’s newsfeed, with a relevant video that they’ll want to click. Look at what trends your demographic is currently into. Are they tweeting about tattoos? Are they Instagramming their Ice Bucket Challenge pictures? Are they making vines about Valentine’s Day? Take a trend, put your own brand spin on it, and post a Facebook video about it. Remember to include relevant hashtags so that you have the chance to garner even more views. 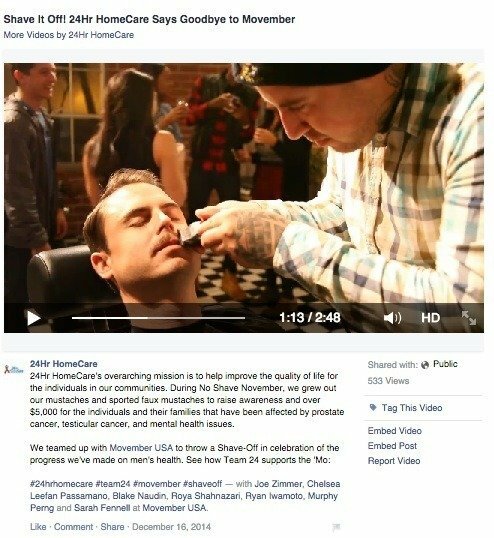 This past fall, caregiving company 24Hr HomeCare posted a video about their dedication to No Shave November. They included the hashtags #movember and #shaveoff so they could be part of the conversation. If you do create a trend video, make sure it’s not like everyone else’s. It should also relate to your brand—otherwise, your fans may think you’re simply opportunistic. You want to come off as genuine, not phony. If you aren’t optimized for mobile, you’re going to have a hard time growing your Facebook page. When people are on Facebook, they view their notifications, answer messages, scroll through their newsfeeds, check in on friends’ and families’ profiles, look at the trending news, and maybe click on an ad. They don’t go on Facebook to watch a long video. When posting a video on the site, keep it short. Data from a Wistia study showed that people are more likely to watch the entirety of a video if it’s shorter. More than 80 percent of viewers watched one that was 30 seconds or shorter, while less than 70 percent watched one that was one to two minutes long. The Coffee Bean & Tea Leaf, a coffee shop chain, posts videos that are mostly under a minute long. The company shows how their coffee is made and uploads fun, promotional videos. Even if your video is going to be under 30 seconds long, the content within it still has to be top-notch. Don’t sacrifice quality just because it’s short. It may be acceptable for users to post short videos they took from their iPhones, but your page has to be more professional. You don’t want any random shot to be your thumbnail. If your followers see an interesting image on their timeline, they’re going to click the video to see it. To put in a thumbnail, hover your mouse over a video you’ve just uploaded, click options, and then edit it. Facebook will give you a choice of 10 thumbnails to choose from. 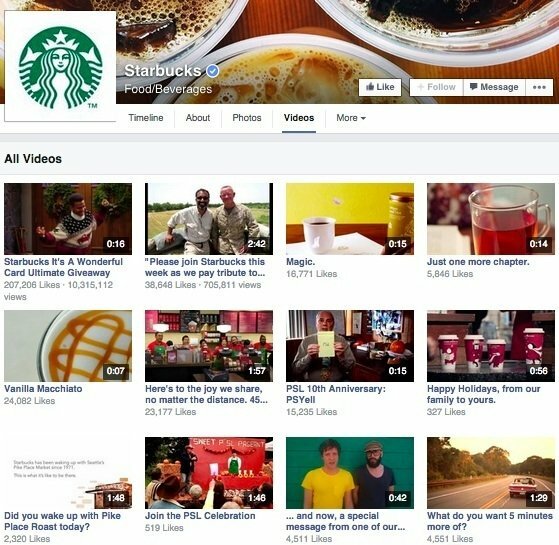 Look at Starbucks’ Facebook videos for inspiration. The video with the most views has a thumbnail of Carlton doing his signature dance on The Fresh Prince of Bel-Air. On YouTube, you can upload a custom thumbnail. Unfortunately, Facebook videos do not yet allow for that, which is why it’s critical that every frame of your video is clear and of the highest quality. How are you using videos on your Facebook page? Do you prefer to upload Facebook videos or YouTube videos onto your page? Which platform do you think is better? Continue the conversation on our Facebook or Google+ pages. Kylie Ora Lobell is a Los Angeles-based freelance writer and content marketer. She's been featured on NewsCred, Social Media Examiner, CMO.com, Postano, Vertical Response, and The Content Strategist.